No matter what type of event you’re having, be it a corporate gala or a lavish wedding, budgeting is absolutely key. Sure, you want to have all the nice bells and whistles included in your event, but a lack of planning and budgeting will leave you frustrated and stressed out about how you’ll be able to afford everything you wanted. Thankfully, there are some great ways to get ahead of the curve when it comes to budgeting for your event, and a little budgeting can make your money go a long way! Here are some tips to help you set your spending limits and make sure you can afford all those little extras. While corporate event planners are generally good about this, couples planning a wedding tend to struggle in this area. Make an extensive and comprehensive list of every expense you anticipate having. Include all the small things that you think won’t add up, too, because those are the things that are more likely to catch you off guard and bust your budget. Be specific when you make a list of potential expenses, and add details to ensure clarity and more precise estimates. For example, if you’re planning a wedding with 250 guests, include that number in your initial list so that you account for a larger venue and higher food expenses. Do your research and get some estimates about how much each item will cost you. Be thorough and detailed—it will only help in the end! Record estimates and ideas, including actual prices and specific details regarding what those estimates cover. For example, one catering company might quote you $2000 while another quotes you $5000—be sure to include specifics for more clarity and less backtracking later on. Once you’ve compiled an estimate of your total cost, you can decide where to trim costs and where you can splurge a little more. Be sure to leave a cushion of extra money for added expenses that may pop up along the way, and decide what really matters to you when planning your event. For example, you can’t have a corporate event without incredible entertainment, and you can’t have a wedding without a great photographer (and great entertainment! 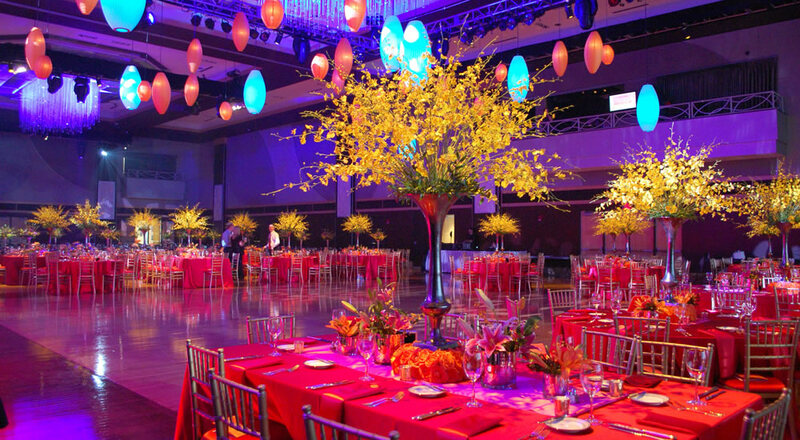 ), but there are other areas of your budget that may not be as important that can easily reduce your overall event cost. If budgeting, planning, booking, and coordinating your event seem way too overwhelming to you, or if you barely got through the last few paragraphs without wanting to cry, you should consider hiring an event management company to take on your entire event for you. Here at Blue Moon Talent, we are a full-service event management company that will handle your entire event from start to finish. From site selection and entertainment to production and customization, we will walk you through the entire process to create the most incredible event that is absolutely perfect for your exact needs. For more information about hiring Blue Moon Talent as your event management company, check out our site or give us a call at 1-888-773-7730.